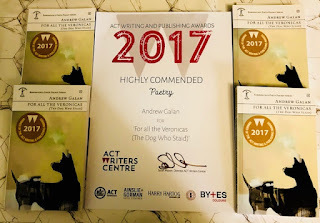 My book, For All The Veronicas (The Dog Who Staid), was shortlisted in the poetry category for the 2017 ACT Writing and Publishing Awards. This is my second book and it was developed with an ArtsACT Project Grant during 2015, and the work also benefited from residencies in El Bruc, Catalonia, and at the Ainslie and Gorman Arts Centres, both during 2014. I haven’t had poetry nominated for a prize previously so I was stoked to have the book make the shortlist in this ACT award and excited to have it receive a prize. Congrats to the other two shortlisted award winners, Chris Palmer with Afterlives, and Carmel Summers who edited The Last Day Before Snow, you can see the full list of awards given on the night at the ACT Writers Centre website.